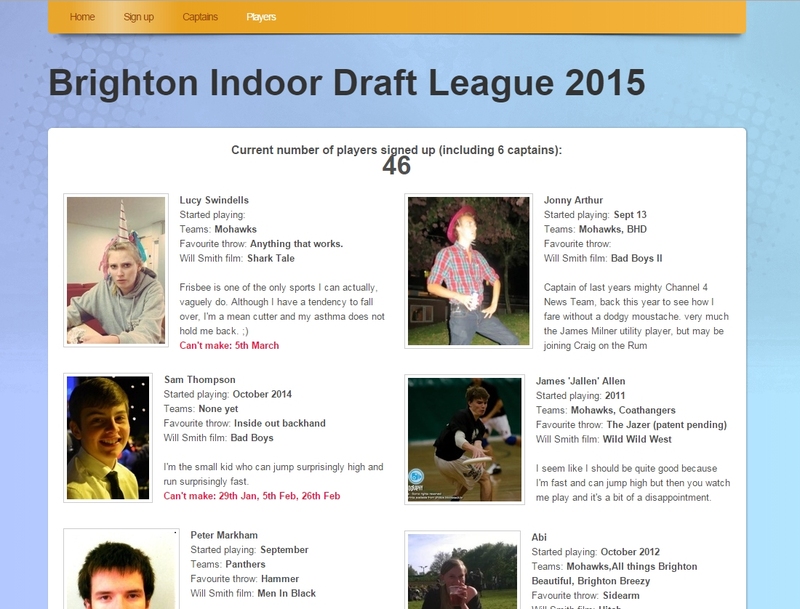 Draft Leagues are a new and exciting phenomenon which have been spreading through Ultimate communities around the UK in the last year – first appearing in Brighton, then onto Manchester, Liverpool and Reading. In this article I’ll outline the basic steps you’ll need to take to get a Draft League up and running successfully. As the sport of Ultimate grows, it also ages, and a week-night league is ideal for players who want to stay involved competitively & in the community, but can no longer commit to full tournament weekends. The fundamental difference between a Draft League and a regular league is that instead of teams signing up to compete, players sign up individually to be added to the Draft, and are then picked by captains on Draft Night. The picked teams then compete each week for the duration of the league. The vibe can be social and friendly, or quite competitive – this is up to you. 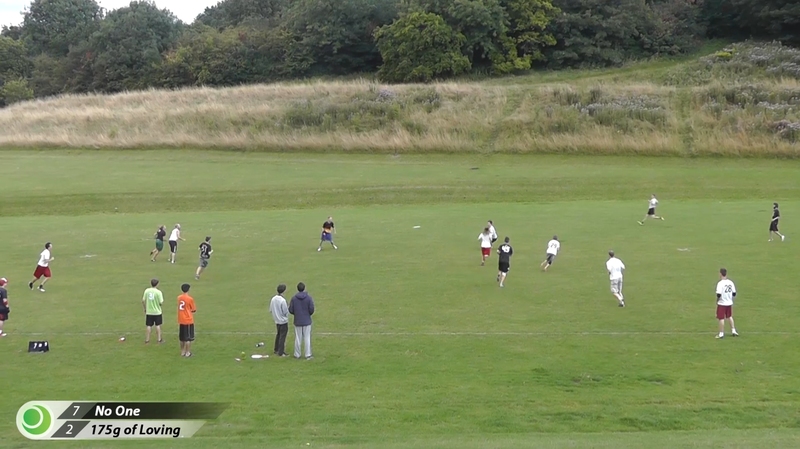 The Draft format breaks down all boundaries between different groups of Ultimate players within a city – players from different universities, divisions, teams – of all ages and levels of experience – compete on the same team as one another, forming new bonds, networking, and bringing the city’s Ultimate community together as a whole. Players who have only just learnt the rules will play alongside veterans who are taking a night off from looking after their kids. Regular weekly Ultimate sessions are now given a structure and a purpose, encouraging more competitive gameplay as well as more fun. 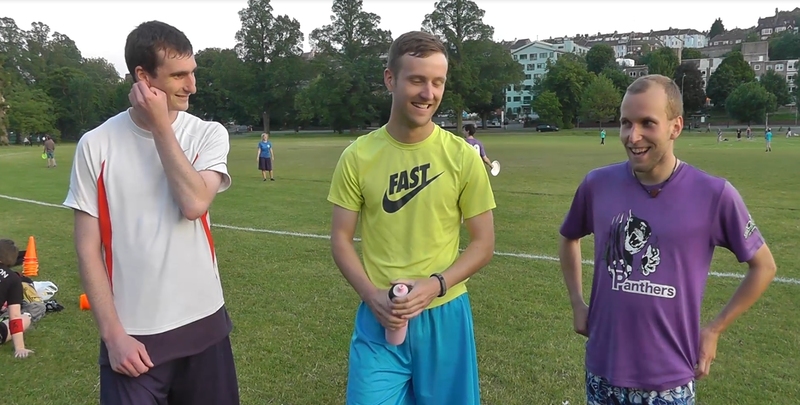 1) Get a venue – the Draft leagues in Brighton run indoors in the winter and outdoors in the summer, however a floodlit winter outdoor week-night league might suit the needs of your city. Bearing in mind when the University terms start/finish, book your venue for 6-8 weeks – having a limited-length season like this will keep players focused and they’ll be less likely to miss weeks. 2) Recruit captains – good captains make a big difference. They don’t need to have captaining experience, or even much Ultimate experience, but it’s important they have charisma, and are of comparable playing ability. 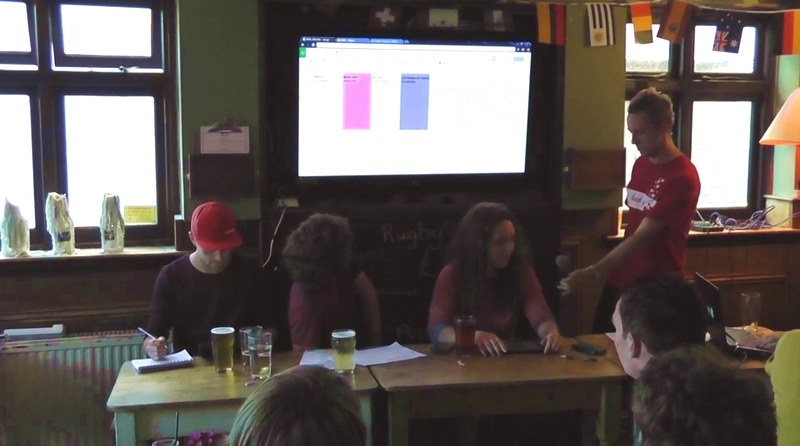 Knowing players in each of the groups in the city is useful too, so 3rd year University students are often good choices, or picking captains which cover a cross-section of your city’s Ultimate community. We even have seasons where all the captains have only been playing 3-4 months. Talk to your ideal captains face-to-face, and get them to write short bios / mission statements & think up a team name for the website before it is constructed. 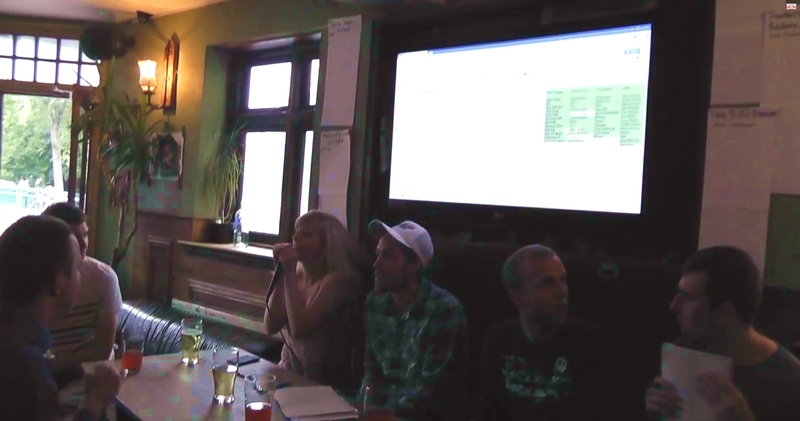 3) Plan Draft Night – you’ll ideally need a pub which has an area you can reserve, a big screen, and a PA system with a microphone you can pass around between the captains when they are making their picks – building up hype between the rounds. Check out these videos from previous Draft Nights. 4) Create the sign-up form – you’ll want to collect basic information such as name, email, years playing, and short biographies of the players, accompanied by a photo. Throw in a couple of fun questions if you like. Google Forms is great for this. 5) Build a website – there are several free online website building/hosting tools out there, such as webs.com. Keep it simple – explain what a Draft League & Draft Night is, when/where the games will be, who the initial captains are, and how to sign up. 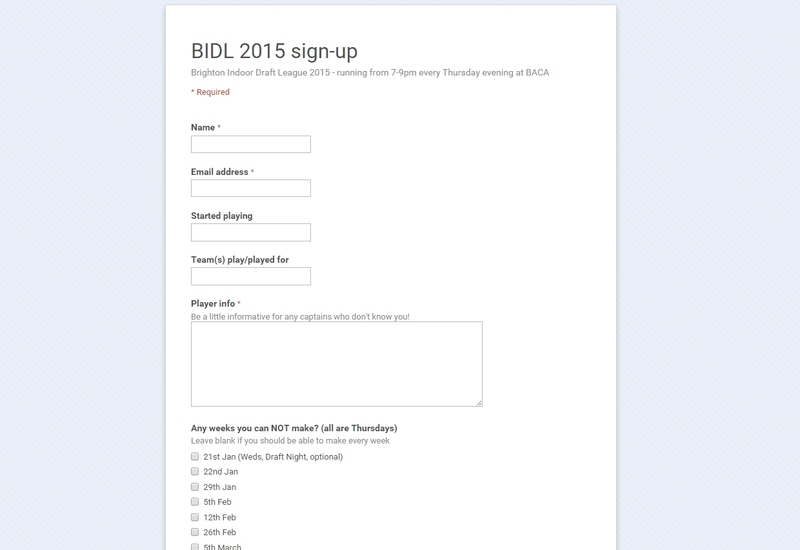 Examples: BIDL 2015, BUDL 2014, BIDL 2014. 6) Get 5-10 initial sign-ups – before announcing the website/signup form to the wider community, contact a number of individuals which cover a cross-section of the teams, and put their bios on the website. This is particularly needed if it’s the first league you’re running, so players can immediately see it is legitimate and supported by the community. 7) Announce sign-ups are open! To boost your initial numbers, consider offering discounts to early-birds/students/juniors, and talking to everyone you know to get them signing up as soon as it goes live. Try to get the influential figures to spread the word amongst their sub-groups of the community – talking to people face-to-face helps with getting them excited about and buying into the Draft idea. Make Draft Night exciting – talk to your captains beforehand, and get them talking more during the first rounds of the evening – giving the history / skills of the player they’re going to pick before they mention their name and such, to build tension and excitement. Between rounds, the host/s should talk light heartedly about the picked players (good for them to know them all), analyse the teams, pick facts out of their bios, and generally provide some kind of angle to keep everyone interested and give the captains time to decide on their next picks. As the draft progresses it should speed up. Getting picked last – in reality, several players in the draft will be expecting to be picked last… most will end up being surprised they weren’t last, and one won’t be surprised. I’ve spoken to the last pick in several drafts, and the overriding feeling is that they’re even more motivated to improve, and show their worth. Every other player near the bottom of the draft is also specifically picked by their captain, which makes them all feel wanted, and helps them fit into the team better than if they were randomly assigned in the last rounds (which we did one year, and won’t be doing again). By the end of the Draft everything is moving quite quickly and everybody’s had a couple of drinks anyway. If you are still worried about the last pick, you can break the player pool into groups and make sure the beginners aren’t left til the end – however this may raise other complications. Fair teams – if your captains all have comparable ability & knowledge of the player pool, we found that, after choosing the initial pick order at random, ‘snaking’ through the rounds was the fairest way to pick. So, with 4 teams, 1st pick will also pick 8th, 9th, 16th, 17th, etc. 3rd pick gets 6th, 11th, 14th, 19th, and so on. If you have a mix of genders in the captains pool, then you should include an ‘opposite-gender’ round or two, inserted at an appropriate time in the Draft. Add whatever you want – Fantasy Leagues, hype videos, player/captain interviews, off-pitch games like giant Jenga, extra points for bringing cakes and sharing them / having beginners playing / spirited play, full league statistics – whatever will suit the community in your city. 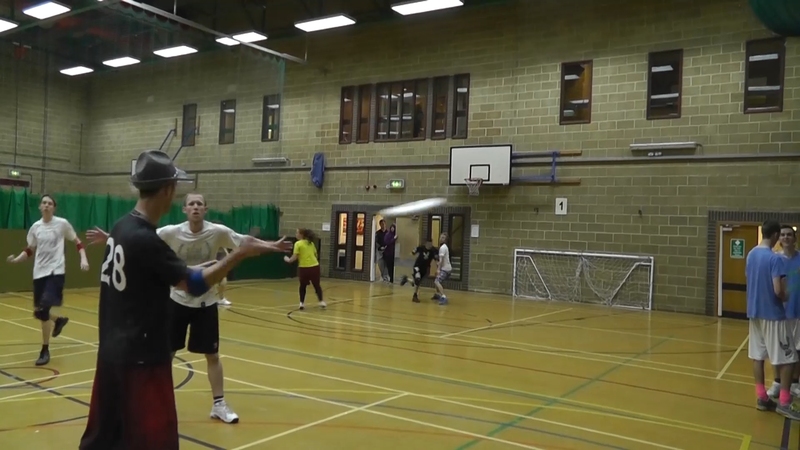 In Brighton we’ve found that our Draft Leagues have brought together players who never would have crossed paths otherwise – our newest freshers are playing alongside our retired-from-Tour, married-with-two-kids veterans. The Draft has placed the players from rival universities alongside one another, both in terms of pick order and as team mates – breaking down any potential ego issues or boundaries built up by the rivalry. The semi-competitive nature of the league has also got players regularly playing their hardest on a week-night, eager to prove their worth and justify their captains decision – perhaps hoping to be picked a round earlier when the next season of the Draft League rolls around. Most importantly, it’s a lot of fun for everybody involved!